Have you ever wanted to make your own invention? Few things are as fulfilling as seeing something that you created sitting on store shelves, ready for the masses to buy. However, the process of making an invention has steps you need to follow in order to protect your intellectual property from imitators. The first step for every invention is getting a patent, which will allow you to legally mass produce your creation. 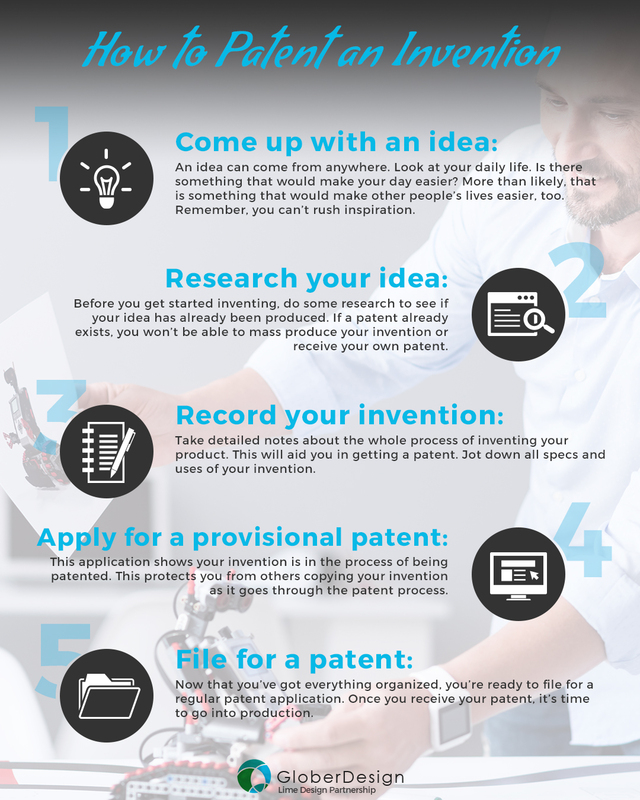 With that in mind, we have put together this handy guide that walks you through the process of making an invention and patenting it. If you are looking for help with making your invention a reality, call Glober Design. We can help you through every step of the process, from patents and trademarks to design and manufacturing. Every invention starts its life as an idea. This inspiration can come from anywhere, so it’s a good idea to have a notebook ready to jot down any ideas that come to mind throughout your day. Pay attention to things you do on a regular basis and think of ways that you can improve that process. Most inventions stem from someone recognizing one of their own pain points because more often than not, it’s something others struggle with as well. While you might have an idea for something outside of your purview, it’s better to stick with things you’re knowledgeable about, as that gives you a better understanding of how to implement your invention and see it through to completion. Once you’ve landed on an idea for your invention, it’s time to start researching to see if your idea has already been produced. Even if it hasn’t, there may be a patent where someone has already laid claim to the rights to make that invention. Search online for existing products that match what your invention can do. If you’ve already come up with a name for your product, this is a good time to see if someone has already used that name for something else. Take a look at stores that would offer your product to see if they already have something that does what your invention is intended for. Check with the Patent and Trademark Depository Library near you to research existing patents and categories that your invention would fit in. It’s also a good idea to have a professional patent search done to ensure there really isn’t an invention already on the market similar to yours. Because patents in the United States are granted on a “first to file” basis, you need to start the patent process as early as possible to protect your IP from imitators. As you’re ramping up toward getting a patent, it is important to keep thorough records of the whole invention process. Notating the specifications, uses, alterations, and all other pertinent information regarding your invention will help with the patent process. Take the time to write down how you came up with the invention, what was your inspiration, how long it took you to come up with the idea, and why you think it is a good idea to make it. Write out everything that you would need to make it, including all possible parts and materials. It’s a good idea to keep records of your research, showing that you did not find any pre-existing products already on the market that are similar to yours. Look into the commercial value of your invention to determine if your earning potential justifies the amount you’ll pay for patent fees. This is also a good opportunity to record an informal drawing of your invention. If you’re not that artistic, having someone better at drawing put this together will help with filing for a patent. As you get ready for filing for a patent, it is a good idea to get a provisional patent application, also known as a PPA, to show your invention is in the process of being patented. Patents can take some time to be processed, so this helps protect your intellectual property from imitators while you wait for the patent to go through. While this step is optional, it can help save you some frustration in case someone ends up getting a patent slightly before you. With all of your preparation out of the way, you’re ready to file for your patent. This will be filed with the United States Patent and Trademark Office, either through their website or at their nearest office. The form will give you step-by-step instructions to follow along with the information that you need to provide them with. This is where you’ll include your records and patent drawing as well. The process of getting a patent for something you’ve invented can be exciting and stressful at the same time. On one hand, you’re taking steps to bring your idea to life, producing something that will make people’s lives better or a bit easier. On the other hand, you might run into a situation where someone has already come up with your invention and patented it, sending you back to square one. Follow these steps to ensure your product doesn’t already exist and that your intellectual property is protected from copycats. If you would like assistance in bringing your idea to life, call us at Glober Design. We can help you with patent drawings, product design, prototyping, and much more. We’ll make your dream a reality. Call today to learn more!